State of the art eco-house is easy and cheap to build. Check Google images for tiny house, small house, eco-house, green living module or just a modern house. See anything you could imagine building reasonably cheaply and easily then enjoy living in? Here is something to stir the imagination, a concept sketch of the Original-Twist Eco-house. And this is not just an eco-house by name; it is a thoroughly engineered, practically off grid living module where the technology comes first and the house is made to fit it. On the first floor a massive structurally open space gives adaptable options. 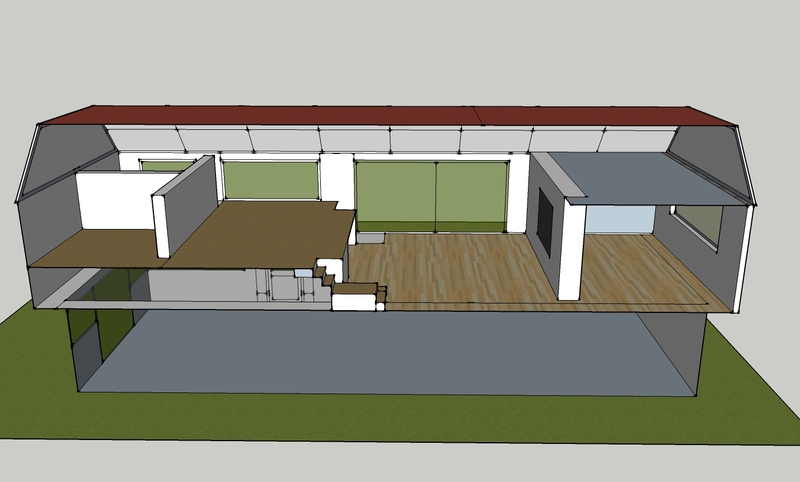 There is space to the left for a huge kitchen diner (7m x 3.5m) or a smaller kitchen and a bedroom/study. Next comes the massive living room (5m x 5m). The raised bedroom platform (4m x 5m) follows and off that a bathroom and an office or child’s bedroom. These are exceptionally large and impressive spaces and with some expensively extravagant oak frames supporting the roof they are characterful too. Everyone loves heavy rustic looking beams and that ‘barn conversion’ look. Bye the way; as a protest against flimsy curtain rails there would be heavily mounted industrial Henderson tracks. Even Tarzan could be trusted to draw the heavy curtains across the windows or the bedroom section. On the ground floor a properly large garage at one end and a full height kitchen conservatory at the other, contain a variable layout of rooms to make a separate living unit. Thus the upper and lower floors combine to make a family house or each make fully independent living spaces. There would be no difficulty making a Granny annex or securing some rental income to pay back some expenses. The foundations for the conservatory should be laid from the start to make it easy to add that on later. Care has been taken to keep the house very basic and thus avoid unnecessary overspends. We want wonderful living spaces and enough cash left over for something special in the double garage. The simple construction suits ICFs (giant foam Leggo blocks with concrete poured in). It makes more sense to stick to ICFs all through; one contractor, less interference and anyway the clever flooring solution that comes with Quadlock ICFs is worth having. The extra thermal mass is a big plus point and also gives good soundproofing between floors. ICFs are particularly suitable for the wooden cladding shown here although the choices are almost endless. Another cash preserving strategy will be to delay a whole list of things until after moving in. The sooner you move in the sooner you stop paying rent somewhere else? The ground floor kitchen/conservatory, home cinema, and all the solar panels can all wait until later and the rent you save will help pay for them. Self builders will appreciate the idea of finishing one floor and living-in to finish the other. A house designed for the hard times of ex-growth Britain deserves a catchy name – we’ll call it The Brexit. The side and rear overhangs allow the house to fit into a small plot. It can be built to within a whisker of the boundary and yet you can still walk round the outside. The balcony at the front echoes the overhang to give a pleasing uniformity. The Brexit is quite small which leaves something in the budget for all the latest mod cons like the home cinema, that car in the integrated garage and of course the eco-kit and the heat pump pod in the garden. It may look fairly conventional (planners note) but the eco-credentials of this house are exemplary. The south side has plenty of glass which adds to the feeling of space and allows for enough solar gain to take us into passivehause territory. Of course the eco-technomologicalness will be state of the art, not just token gestures as in many eco-houses but the highest expression of the art. The 24 Sunerg hybrid solar panels actually dictate the size and shape of the roof and the roof trim panels are fixed directly to the panels (PV and wet solar are both 2m x 1m). 4 of the panels on the steep roof will be wet to give a massive 8sqm to feed the Original Twist twin tank heat bank design. 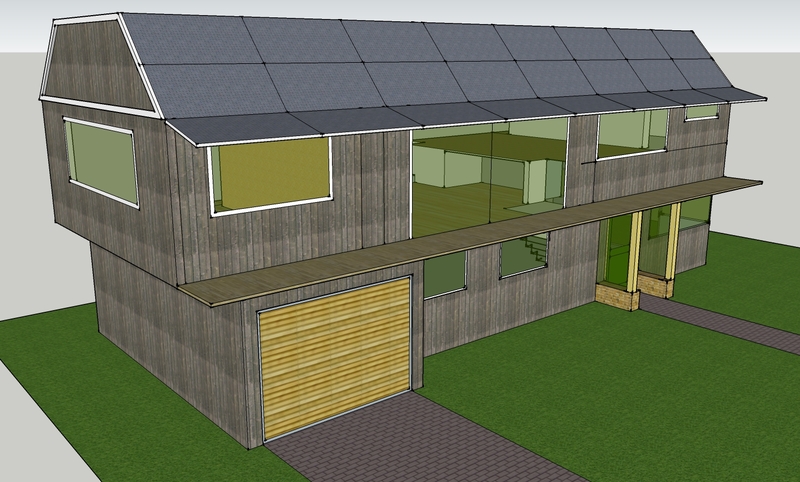 If you are involved in creating anything remotely like an eco-house you should study this system here. The other 20 panels give a nominal 6kWp and a real 2-3kW in the winter to run the little air source heat pump which also does some neat heat recovery from the house and uses some ground heated air too. Batteries make a huge UPS which largely makes the mains supply more like a backup especially if combined with the batteries in the electric car. The Brexit is designed to be future proof as much as possible. More detail can be found in the e-book ‘Dream House – Down to the Details’ here. Don’t start any project without investing £2.45 on this book. To convert the living space into a dining room the table comes up from the floor – (see the design here)…… the TV disappears behind a roller cover and the sofa glides back into the recess behind it; fanciful maybe but it makes excellent use of the space and easily accommodates large dinner parties. The sofa mechanism is quite simple with the sofa parking on top of the cover door when it is deployed. The table concept is equally simple but pretty spectacular in action and the small extra cost effectively produces an extra room. And what a super house to start the day in. A cuppa in bed on your lofty bedroom, as the heavy curtains automatically retract you watch the morning news on the big screen; time for showers then a sunny breakfast downstairs before nipping through to your dream car. The garage doors rise automatically and you are off on your day. How much roughly? 188 square metres at £800 is around £150,000. £25,000 for the eco-tech and heating systems, so maybe £180,000. Call it £200,000 plus the plot cost. Looks like a lot of good living for the money, and don’t forget, this versatile house has considerable earning power and almost no running costs. Think clever, think Brexit.